What is feminism? If you asked people on the street, the most common response is “equality.” Yet at the darkened heart of today’s faux feminism, there is no equality because it is violently hostile to Life. You can dress it up in all the pink banners, euphemisms, and #ShoutYourAbortion tweetfests that you’d like, but the truth can’t be hashtagged over. Without Life, there is no equality. By the way, Senator Cory Booker’s recent absurd defense of Planned Parenthood (bizarrely comparing pro-abortion “feminists” to the courageous WWII soldiers who gave their lives to storm and take over Normandy Beach) was historically-challenged. He mistook Hamer’s famous “sick and tired” quote as Sojourner Truth’s words. Pro-abortion politicians like Booker will contort and distort anything to justify the slaughter of millions in this country by a billiondollar abortion industry. Pro-slavery politicians did the same to defend the institution of slavery which barbarically treated another group of humans as dispensable property. “I have borne thirteen children, and seen most all sold off to slavery, and when I cried out with my mother’s grief, none but Jesus heard me! And ain’t I a woman?” These words , which were from Sojourner Truth, show the mourning of a woman whose children were forcibly ripped away from her to profit an industry. How much more tragic, today, that children are ripped apart within and from their mothers in order to profit an industry? Modern (counterfeit) feminism preaches victimhood while celebrating violence against the actual victims. Millions of women, however, defy this broken worldview. And I am honored to work with so many who elevate human dignity by defending the weakest among us. My amazing wife, Bethany Bomberger, is a powerful example to our four children as she dedicates her life to cherishing mothers and their children. These are remarkable women, mostly ignored by #fakenews media, but those who have helped to save millions of lives over the years. 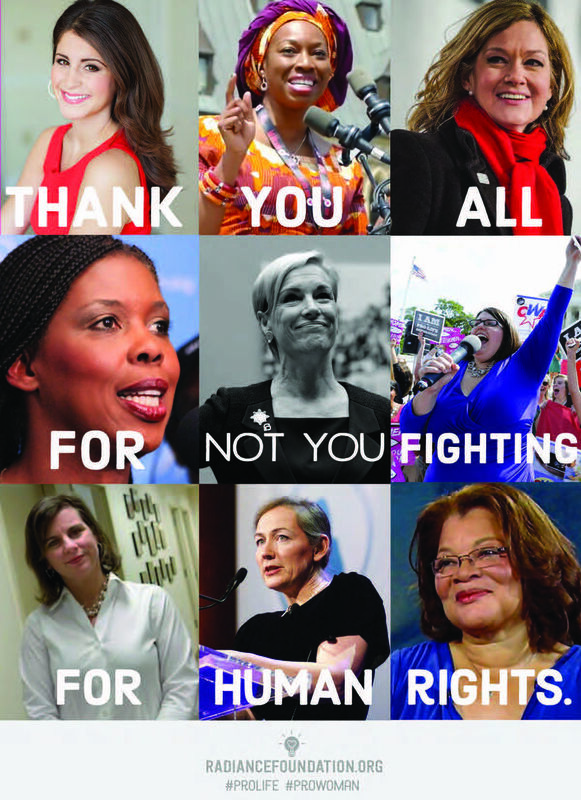 There is no way to provide an exhaustive list, but I wanted to highlight a handful in these “Not You” memes. Cecile Richards, President of Planned Parenthood, is the ‘Not You’ figure. Can’t wait for her to experience a soul-changing transformation and become the one fighting for human rights, instead of aborting them.